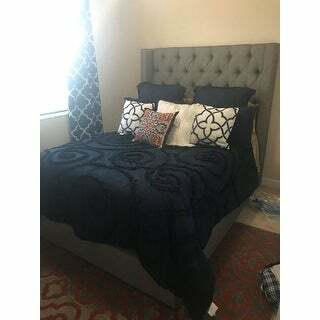 Coordinated with luxury detail on decorative pillow to furnish you with completed handmade look, this rich navy comforter boasts an artistic, scalloped, real-life floral cut-out design, carefully sewn to create amazing detail. 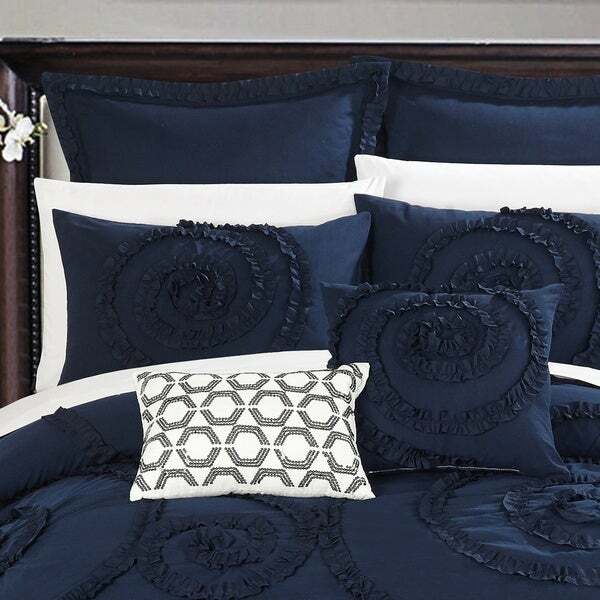 Crafted applique gives this bedding set an amazing custom feel. My wife and I both were looking for navy comforters for our guest bedroom. We both loved the way this comforter appeared on the online photos. Different story when we received the comforter it was flat and cheap. The pillows we purchased (prior to buying this comforter) looked way more expensive than it did. Also measurements are off. 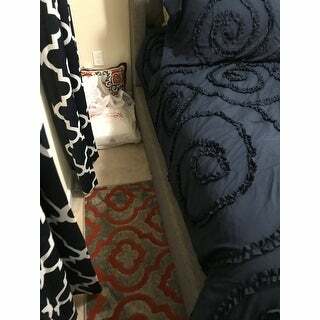 I purchased the king comforter to go on queen bed and it still looked to small. So I took the liberty to measure the comforter it was actually 85 inches long and not 90 inches when I saw that I didn't bother to measure the width. Plus the euro shams do stand up, the ruffles just flop over. Love the concept but horrible and cheap construction. Like on project runway Navy Comforter I'm sorry your out...lol Needless to say we are returning it. here are some pics they say a thousand words. 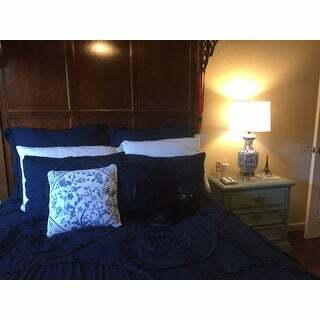 Here are two pictures of the bedspread - it looks wonderful. I switched out the decorative pillow and added the drapes which are also beautiful. I've washed the bedspread several times with no problems whatsoever. Love! 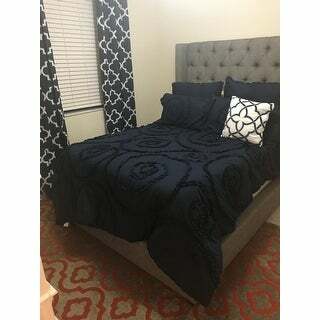 We are very pleased with this bedding collection the color is as pictured a true navy blue which was the third set that we purchased from other retailers and their colors were not a true navy. The color blocking gives it a tailored look We find extremely pleasing. I absolutely LOVE this comforter. The color is beautiful and exactly what I wanted plus the detailing on it makes it look super expensive. Color is true to online picture - very deep navy blue. The decorative flowers on the comforter and pillows are ok, but in a few places you can see traces of white (thread) which is very obvious against the dark blue. But overall, I like the look and appreciate the subtle but interesting look of the cutouts. Love the way this comforter set brings my bedroom together for fall and winter. I made a dust ruffle and cornice covers and could not find anything that pulled it all together. Now I have! Thank you Overstock!!! Love this comforter! Packaging was good and looks exactly like the picture. Color matched great! This comforter is pretty but it is not made very well for regular washing. It was fine the first few times in the washer and dryer but hen it started to have stuffing balled up inside and I was never able to loosen it up. I wash my comforters regularly because of animals so for someone who does not need to wash it often I’m sure it olwould hold up. This came out even better than I imagined it would. It fits perfectly and is absolutely gorgeous in my room! Its beautiful and comfy . Bought it for myself but it didn't fit my bed so it's at my daughter's and it looks so nice . We both love it.. Great buy . The material was very shiny and flimsy, looked so cheap. No, I would not recommend. "Is this set available in a king or California king "
It was not what I originally wanted but I have a rug to match that came from my Mother who is no longer here. I think the color is beautiful and with black cats, I don't think I can go wrong. It's for my sisters birthday, she has a new home and I thought it would be perfect with her linen green headboard. Plus it is beautiful. I liked the colors and the price. Was so happy with my recent purchase of solid wood barstools that were shipped to my door. Waiting for my house to be finished after a fire. Less than 2 weeks, yeah! "Is this large enough that a bed skirt is not needed?" The overhang length of this comforter depends on the height of your bed. You can use a bed-skirt if you would like, or not if that is your preference.